As we arrived at Perdition, the attraction was about to open to the public and we were pleased to see a line of guests waiting to experience it (always a great sign). We parked and approached the attraction, which is a maze built within a large “box” structure that takes up the family’s driveway. A projection in the front yard on the front of the residence was displaying loud metal-ish music videos, which was an immediate concern. 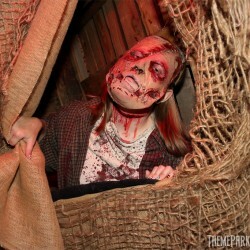 We’ve said it once and we will always say it: setting the tone for guests as they arrive at your haunt is imperative; as soon as we heard the music, we were concerned as to what the content of Perdition would be. Would the maze be strong enough to stand on its own regardless of the ambient “entertainment” outside, or would it be a completely amateur production of “haunt stew” (everything haphazardly thrown together with no specific rhyme, reason, or theme) drowned out by even more head-throbbing music inside? We didn’t know what to think. The crew met us and expressed how happy they were to have us visit; they then disappeared back into the maze, as it was time to open. 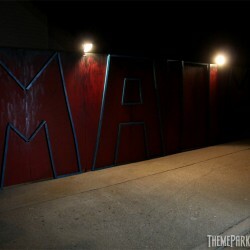 As we do with all haunted attractions, we ventured into the maze, which was dubbed “Maim” (each season, Perdition selects a different theme/name – more on that in a moment). Just a few feet in, we could tell that this crew was totally legit, and knew what they were doing. The next few rooms revealed highly detailed scenes that were really well done; the team is relatively young, but they absolutely know how to build a haunt. 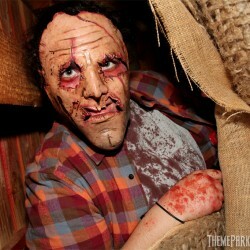 This is something that became very evident to us as we visited several home haunts in 2012: there is a whole new generation of young people that aren’t just clueless fans playing haunted house in their garages; regardless of the fact that many of them are still in school and have never worked a “pro” haunt in their lives, they get it, they have incredible vision, and they’re bringing it hard with these home haunts. 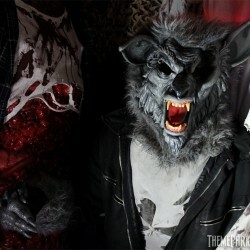 With limited resources and budgets, these enthusiastic young haunters are a new breed that all of us seasoned veterans should be very excited about; it’s this new blood that is going to evolve the haunted attraction industry into the coming decades – and I am totally stoked about it! Not only was the layout and creative direction fantastic at Perdition, the talent is as good at scaring as they are making a haunt. Everyone seemed dedicated, pumped to be there and absolutely were comfortable in their environment. They worked it, and so that box too is checked when it comes to Perdition Home. The length of the maze was really impressive, considering they did the layout on the driveway of the home. Each room and walkway was very well thought out and the path of the maze snaked and turned back on itself beautifully, creating a very decent length of experience; an excellent use of limited space with no negative observations from us at all! There is no facade on the box containing the maze, which is something that the team may want to look at in the coming years; even minimal theming will help set up the story and get guests in the proper mindset. 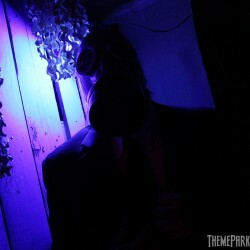 I say use the projector used on the front of the home to help the story as well each year rather than waste it on loud music and videos that will likely turn off 75% of the crowd waiting to experience the haunt. Use that projector to your advantage, not a throw-away; project onto the box containing the haunt or for an effect within the maze! Most of the people we observed in line couldn’t have cared less about the music or videos. Integrate that hardware into the show itself. After seeing the creative drive these folks have, there is no way I will believe for a second that they can’t do better and use the projector to their thematic advantage. In closing, the only other suggestion for Perdition’s team would be to choose a single name and stick with it rather than changing it up each year. 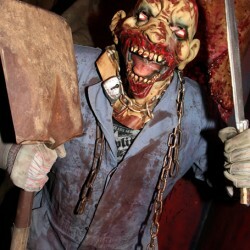 Giving a haunt two separate names is only going to confuse people; the only event that can dual wield names and get away with it is Knott’s (Scary Farm / Halloween Haunt), simply because they’ve been doing it for 40 years and most fans have grown up with it, calling it by both titles. 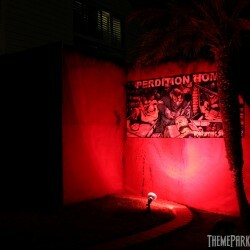 Perdition is relatively new, and to give it a different name each season seems really counter productive to me; until we were about a week out from visiting this haunt, I literally was under the impression we were going to see two separate attractions in Yorba Linda – Perdition Home and Maim. 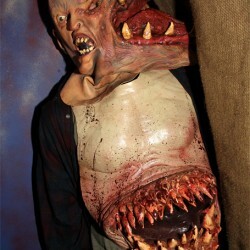 I didn’t put the two together until I started reading various comments about the haunt online. Even if the theme itself changes from year to year, I’d strongly recommend to this team that they focus on getting one singular name out there and sticking with it so it becomes ingrained in fans’ minds. 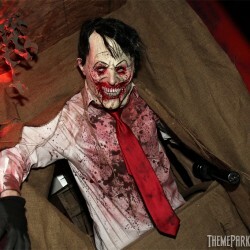 The last thing you want is confusion when it comes to marketing your home haunt; keep it simple and keep it badass so you can grow your reputation and dedicated fan base. 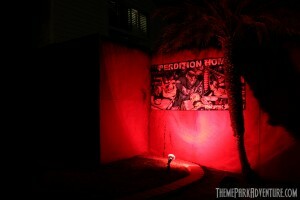 We really enjoyed ourselves at Perdition and thank the men and women who invited us in to shoot still images and video! This is a home haunt that Theme Park Adventure would recommend to anyone – kudos to the crew; we look forward to seeing them continue to grow and do amazing things in years to come! 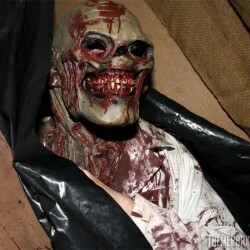 This entry was posted in Haunted Attractions, Home Page, Home Page Slider and tagged Perdition Home. Bookmark the permalink.